We head out of Camp Vengeance and journey toward, then up, the great plateau of Mbala, which has a severe pterafolk problem. Away from the safety (safe now anyway) of Camp Vengeance our heroes trudged southwest through the jungle toward Mbala, a massive plateau that should provide them with a clear view of the surrounding jungle. If they can make it to the top. Leaving the relative comforts of Camp Vengeance behind (as well as the Order cleric Undril), the party headed southwest toward Mbala, a notable landmark and strategic location within the jungles of Chult. Only a single potentially dangerous encounter lie in their way, when they stumbled into the territory of a pair of four-armed gorilla monstrosities called Girallons. The beasts grew defensive and territorial, but the party was curious about the dead body of an adventurer nearby. Gillian attempted to cast Sleep to at least knock them out, but the 36 hit point spell was nowhere near enough to lull even one of the beefy creatures, and they attacked in retaliation. Roll for Initiative! The Girallons started in their tree about 20-feet up. Khaless used Vorn as a springboard to leap up and attack with her blades, while George used his Gloves of Climbing. Girallons have an insane multiattack where they can attack five times in a round, four with their claws and a bite. With this whirlwind assault I got in several nasty hits on both of them, despite only an overall 50% hit rate. Therin wildshaped into a bear to climb up the tree and with the combined might of the heroes, plus ranged attacks from the others, the apes went down. 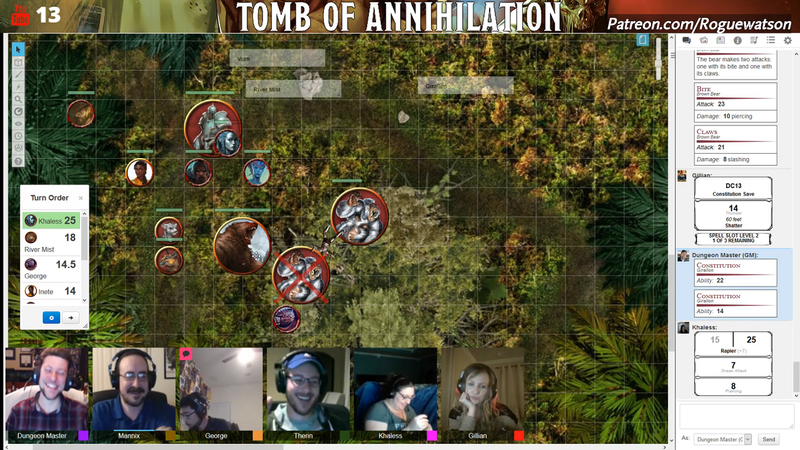 The party’s reward was a small treasure cache on the dead scout, including gold, potions of healing, and a Ring of Jumping. The scout had been searching for an “A.C.” in the jungle – Artus Cimber. After a few days of travel the party arrived at the base of Mbala, which stretched nearly 2,000 feet up into the sky. The tabaxi mentioned that there used to be a grand village at the top, but nobody knows what happened to it. They found a small path that cut right into the cliff face, seemingly winding all the way to the top. Unfortunately it was too tight for Vorn, whom they had to leave behind at the base. At more than halfway to the top they heard the flapping of wings and screeching cries of nearly half a dozen pterafolk headed right for them. 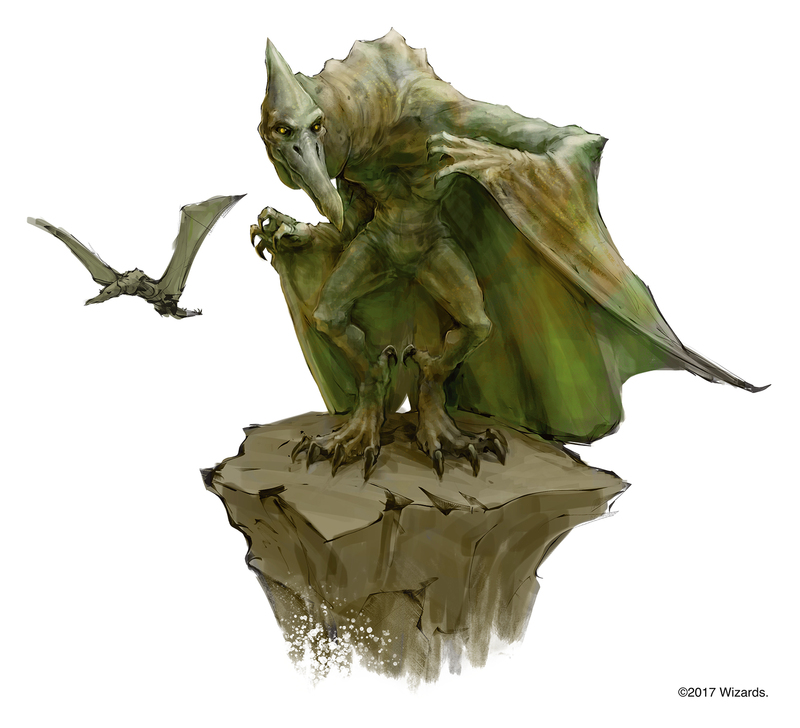 The winged humanoid pteranodons swooped in with claws and javelins, hoping to capture some fresh food for their nest. Gillian cleverly cast Fog Cloud, obscuring most of the party while George drew them away. Fighting on a tight cliff edge put the party had a challenging disadvantage, and eventually the harsh winds of the cliff dissippated the Fog Cloud, leaving the party more exposed. They fought off and killed three of the pterafolk but the last two were able to grab Mannix and George, with George allowing himself to be captured to see where the pterafolk went. The pair flew several hundred feet through sky around the plateau into a ledge and cave opening, where many more hungry pterafolk lie waiting. How will the party deal with this forced separation? We’ll find out next time!